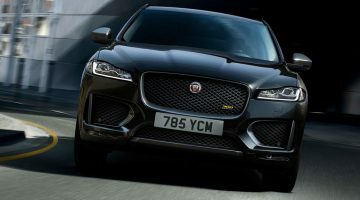 It was inevitable, really: Jaguar has put its supercharged V8 into its mid-sized SUV to create the F-Pace SVR. The performance off-roader will do battle with Porsche’s Macan Turbo Performance Pack, Mercedes-AMG’s GLC63 and Alfa Romeo’s Stelvio Quadrifoglio when it goes on sale in the summer of this year. The F-Pace SVR will, however, be more expensive than its rivals. At $105,860 it’s pricier than the Alfa and Porsche, both of which are just less than $99,000. But the Jag has a trump card: it’s significantly more powerful than both. The SVR’s supercharged 5-litre V8 puts out 542bhp, 38bhp more than the Alfa and a huge 108bhp more than the Porsche. The torque the engine produces is equally impressive. The Jag puts out 501lb ft compared with the Alfa’s 442lb ft and the Porsche’s 443lb ft. However, all that extra power doesn’t translate to exceptional performance figures given what its rivals can achieve with less. The SVR accelerates from 0 to 100kph in a claimed 4.3sec, meaning it’s only 0.1sec faster to the benchmark speed than the Porsche and half a second slower than the Stelvio Quadrifoglio. It’s also 2kph short of matching the Alfa’s top speed of 285kph. The F-Pace’s 1995kg weight figure, some 165kg heavier than the Alfa Romeo, goes some way to explaining the Jag’s underwhelming figures, but then the Porsche is no featherweight at a similar 2000kg. As with the other models in the F-Pace range, the SVR uses an eight-speed automatic gearbox and four-wheel drive. 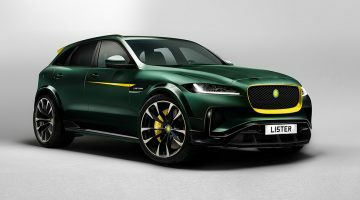 It also gets an electronically controlled limited-slip differential, while the chassis has been uprated with SVR-tuned dampers, thicker anti-roll bars, and springs that are 30 per cent stiffer at the front, 10 per cent stiffer at the rear. 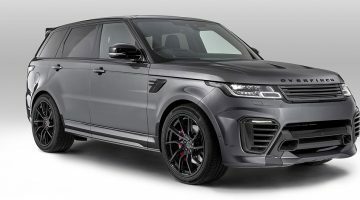 Two new sets of wheels are available for the SVR: 21-inch versions come as standard, while 22-inch items are an option. Both wheel designs are forged aluminium and guide air to the uprated and larger brakes (395mm front discs, 396mm rears). It isn’t just the wheels that set the SVR apart from the more regular models. The bonnet features two vents to aid engine cooling, there are larger air intakes in the front bumper, and bigger gill-style vents help air escape from the front wheelarches, lowering pressure and reducing lift while also benefitting brake temperatures. A set of black wheelarch extensions and lower body mouldings add to the car’s aggression. At the back, the bumper has been redesigned to accommodate a new quad-exit exhaust – the active system varies the exhaust noise volume while also contributing to the engine’s power output. The system also weighs 6.6kg less than the standard F-Pace’s exhaust. Inside the SVR there’s an SVR badged steering wheel with gearshift paddles mounted to it. There’s also a pair of supportive bucket-style front seats trimmed in quilted leather similar to those in the F-type SVR. The rear seats, rather than being a simple bench, are also more sculpted too. The standard F-Pace’s rotary gear selector has also been replaced in favour of the joystick selector found in the F-type. Previous Article[DRIVEN] The all-new 2018 Ford Expedition. One Giant Leap.